A novel investigative technique has for the first time revealed asymmetrical alterations in specific anatomical structures in the human brain during the progression of dementia. Alzheimer’s disease is characterized by pathological changes in the structure of the brain. As the disease progresses, brain tissue is irrevocably lost, in particular in the hippocampus, which plays crucial roles in memory and the processing of emotions. A team around LMU neuroscientist Christian Wachinger has now, for the first time, shown that morphological asymmetry increases as dementia progresses. 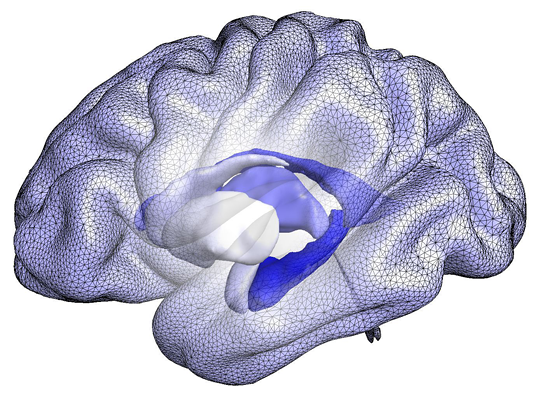 Moreover, the asymmetry of a number of cortical and subcortical structures is predictive for disease onset. The study demonstrates that abnormal asymmetries in the morphology of certain brain areas (without concomitant alterations in overall volume) are already detectable at early stages in the development of Alzheimer’s. “Our study shows for the first time that, in Alzheimer’s patients, the asymmetries in the hippocampus and the amygdala become more pronounced over time and are therefore correlated with disease progression,” says Christian Wachinger, the first author of the new report and Professor for Neurobiological Research at LMU’s Hospital for Child and Adolescent Psychiatry, Psychosomatics and Psychotherapy. The findings have just been published in the journal Brain.